Dustin Nguyen’s artwork has a soft, warm heart at it’s centre which is why the L’il Gotham line was so successful. Similar to some other artists, he employs a thin almost non-existent ink/pencil border. Combine that with the water based colouring and you have a light and enigmatic appearance to all the characters. He has developed his own take on how to draw children, for children and this was so expertly shown in the title mentioned above. 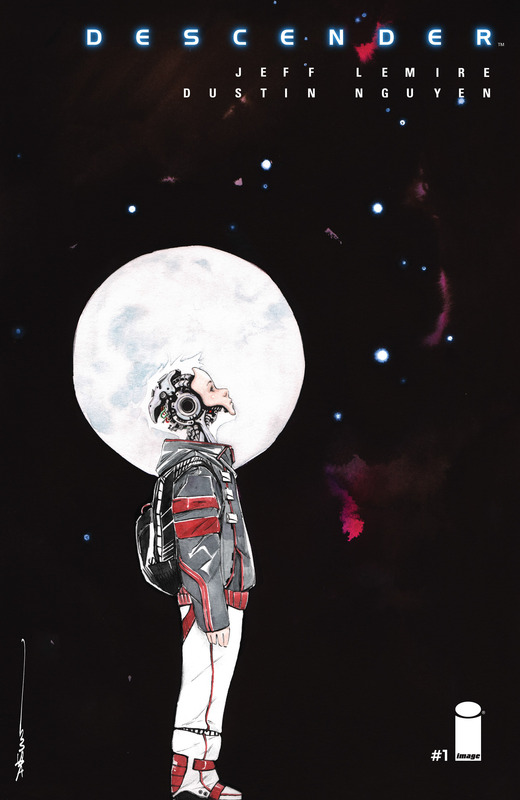 As he combines with Jeff Lemire, the approach with a more adult book and his youthful character is drawn more traditionally. This cover encapsulates that feeling everyone has had where they stare up into space in awe and wonderment. The background is so pretty and coloured so delicately with the night sky littered with soft reds and blues of the stars. The child standing with his side to us is looking up at an unexpected angle, almost towards an object gravitating off the page. He already looks quite futuristic as his garb is more futuristic and a helmet belonging to a spacesuit. His head in actual fact is quite strange if you consider that the machinery so precisely drawn may not actually be part of the headwear but part of the child itself. The colours and pencils are so well balanced that Nguyen is able to bring some light to his clothing as the greys have lovely creases and shades. The most pertinent theme of this cover is a nod to the unknown, there is more than just sky up above him and he is distracted from the beauty we all can see. It asks the question and slowly lures you to come and turn the page. Next PostThe Theatre List 4/3 – Yes last week was really that good! Loved this cover, and the issue.